I know Iowa's not the absolute coldest place in the U.S. or world, but just thought I'd let y'all in on what we got going on today. Pic taken in my work van. I was kinda grumbly today because it is FRIGID here, probably around 32 and windy. My hair was full of static and my skin felt dry and I was ready for SUMMER! Cold, dry weather...brrrrrrrr. It could at least have the decency to SNOW! And then you posted this! Honestly. Talk about redonk. That is YUCKY. Yucky, yucky, yucky. HEY! Where is the conference going to be? Have you heard? You could move to Vancouver its much warmer…and we are hosting the Winter Olympics in Feb! Had another morning that was exactly the same today! I started the van in the hospital's garage, and the thermometer said 47º. As I got out into the open, the temp kept going down, down, down, to -17 again! Later on I think it ended up warming up to 0º!!! --- which is -17ºC. Livingsword!!! I was just thinking about you yesterday, around the same time your comment came in! I just didn't have time to comment at the time. How've you been! Great to hear from you. I betcha that's quite an ordeal, having your city host the winter Olympics!! Jamie... yep, 32ºF IS literally FREEZING! 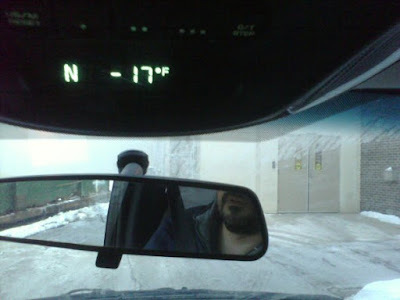 LOL The experience of 17 below zero is kind of hard to explain to anyone who has a hard time with 32 above... hehehe. The Grace Walk site says the conference is April 9-10, but the location is TBA. I'm ready to make plans! Had such a great time with you all last year, and I'm having a hard time waiting till April! !